London & Amsterdam, 19th June 2018. AlgoDynamix has appointed Rob Theunissen to the role of Managing Director. 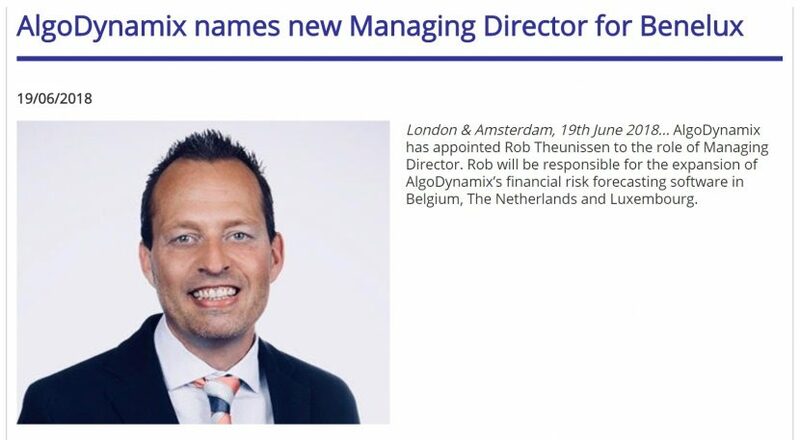 Rob will be responsible for the expansion of AlgoDynamix’s financial risk forecasting software in Belgium, The Netherlands and Luxembourg. Rob has over 20 years industry experience. He has been with Kempen & Co. for 17 years and most recently served as Chief Digital Officer. His main focus will be on expanding AlgoDynamix solutions proposition in the Benelux countries. He is in the right position to help AlgoDynamix grow on an international level. Rob is extremely respected across the industry and will be a fantastic addition to the management team. Jeremy Sosabowski, CEO and Co-Founder, commented: “We are delighted to welcome Rob onto the team. His passion, knowledge and experience within the investment community will strengthen the team considerably and we are delighted that he has clearly recognised the immense global potential of our risk forecasting tools”. AlgoDynamix risk analytics provide hours or days advance warning of major directional market movements. Unlike other solutions, the underlying technology does not require any historical data or knowledge of any previous disruptive events. Our products are used by investment banks and asset managers including CTAs, hedge funds, family offices and other managed funds. The company is backed by institutional investors including Amadeus Capital Partners and was recently nominated as one of the UK’s most disruptive technology companies.